The prevailing time is called as the age of metabolomics because, now days, metabolomics has dominated genomics and proteomics studies [1,2]. In ancient science, biochemist still had no powerful and reliable techniques to analyze the metabolites and proteins in biological samples . This is one of the major reasons, for the necessity of mass spectrophotometry (MS). Eventually the technique was discovered, followed and now has been established as the most advanced technique in biochemistry . Due to the reliability, reproducibility, wide applicability and contribution in modern biomedical sciences, the technique is now dominating over most of the genomics and proteomics techniques. A MS works in an order to detect samples accurately. The basic principle employed in a general MS used widely is, the larger samples are separated using tools, such as liquid chromatography or gas chromatography (for protein and lipid samples, respectively), the separated samples are fragmented, and then individual chemical species are ionized and sorted on the basis of their of their mass to charge (m/z) ratio . Due to the above unique process that takes place in tandem for a sample in MS, this technique is used to purify, identify, and quantify molecule(s) from pure unknown samples or from tissue homogenates or from impurities . Now days, MS techniques are modified and widely used as per the requirement(s). A MS has essentially many common parts, such as separator, fragmenting unit, ionizing unit, mass analyzer (electric or magnetic), detector and signal multiplier. Subsequently, a “sector instrument” was developed and used by monikers to name a group of MS that uses a static electric or magnetic sector separately in space or in combination, as mass analyzer . The terminology “sector instrument” otherwise called as sector based MS (Figure 1) (iupac.org) has thus specialized analyzers. 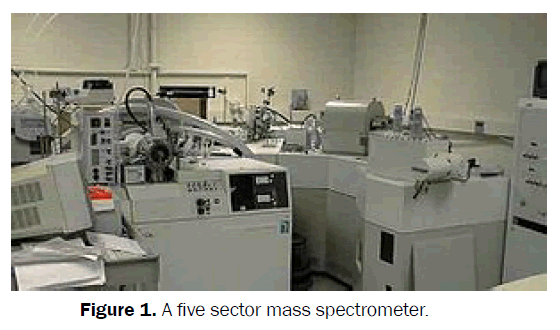 Figure 1: A five sector mass spectrometer. A popular combination of these sectors is Bagnetic-electric-magnetic (BEB). Most modern sector instruments are doublefocusing instruments in which ion beams focus is controlled for its direction and velocity . The behavior of fragmented samples in ionic form is important in any MS technique. It depends on a homogeneous, linear, static electric or magnetic field (separately). For example, as is found in a sector instrument (Figure 2). Like other MS, the sector based MS is also governed by two laws. One is Lorentz force law in which the force is measured by the equation F = Q (E + v X B) and the second is Newton’s second law i.e. F = ma and this is applicable when the ionized molecules move with a velocity less than the velocity of light [5,7,8]. Here “F” indicates the force provided to ion, “m” indicates ionic mass, “a” indicates the acceleration by with which the ions move, “Q” denotes charge of the ion, “E” denotes the applied electric field, and “v × B” denotes the cross vector product between the ionic velocity and the magnetic field. When both the equations are combined it result in (m/q) a = E + v X B and is widely accepted as a classic equation for charged particles to measure their movement . The force applied for movement and subsequent detection of the fragmented ionized samples is only thus dependent on the magnitude and type of charge contained (by samples) and strength of the electric field applied. Type, magnitude of charge and mass of the fragmented particles (samples) drive themselves to move faster, slower, or deflected from their usual path (after ionized) under electric or magnetic fields. Therefore, lighter the ions are, will result in more deflection and the opposite will be true for heavier ions based on the difference in inertia. Finally, the ions will be physically separated from each other in space as per their m/z ratio during their movement under electric r magnetic fields. The ions will beam into distinct rays when they exit the electric sector. And the force on an ion in a linear homogenous magnetic field (a magnetic sector) is: perpendicular to both the magnetic field and the velocity vector of the ion itself, in the direction determined by the right-hand rule of cross products and the sign of the charge. The force in the magnetic sector is complicated by the velocity dependence but with the right conditions (uniform velocity for example) ions of different masses will separate physically in space into different beams as with the electric sector. 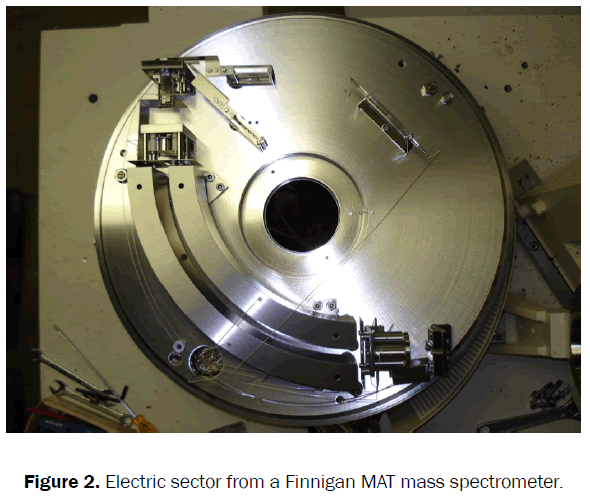 Figure 2:Electric sector from a Finnigan MAT mass spectrometer. These are some of the classic geometries from mass spectrographs which are often used to distinguish different types of sector arrangements, although most current instruments do not fit precisely into any of these categories as the designs have evolved further. Bainbridge-Jordan sector instrument geometry consists of a 127.30°electric sector without an initial drift length followed by a 60° magnetic sector with the same direction of curvature. Sometimes called a "Bainbridge mass spectrometer," this configuration is often used to determine isotopic masses. A beam of positive particles is produced from the isotope under study. The beam is then subjected to pass under the perpendicular electric and magnetic fields. The beams of ions are then allowed to pass freely via a slit, and are then subjected to another magnetic field. This second magnetic field changes the path of the moving ions into a semi-circular shape and, finally they hit on a photographic plate for detection. Further analyses of the signal then identify the mass of the isotope. Due to the modification in SBMS, the robustness of the data is very high to identify and quantify even isotopes of an element. Thus the geometry in SBMS is important. For example, in the Mattauch geometry consists of a 31.82° (radians) electric sector, a drift length which is followed by a 90° magnetic sector of opposite curvature direction. In the Mattauch geometry, the entry of the ions sorted primarily moved into the magnetic field by the possessed charge. It produces an energy focusing effect and much higher transmission than a standard energy filter. Such geometry is often used when high robustness of data is required. Thus its applications with a high energy spread in the produced ions increases the sensitivity, such as in spark source mass spectrometry (SSMS) and secondary ion mass spectrometry (SIMS). The advantage of this geometry over the Nier geometry is that the ions of different masses are all focused onto the same flat plane. This allows the use of a photographic plate or other flat detector array. The Nier geometry consists of a 90° electric sector, a long intermediate drift length and a 60° magnetic sector of the same curvature direction. TIn the “Hinterberger-Konig” geometry a 42.43° electric sector, a long intermediate drift length and a 130° magnetic sector of the same curvature direction are used. The Takeshita geometry consists of a 54.43° electric sector, and short drift length, and a second electric sector of the same curvature direction. However, this system in Takeshita geometry is followed by another drift length before a 180° magnetic sector but in opposite curvature direction. The Matsuda geometry consists of an 85° electric sector, a quadrupole lens and a 72.5° magnetic sector of the same curvature direction . This geometry is used in the SHRIMP and Panorama (gas source, high resolution, multicollector to measure isotopologues in geochemistry). Due to high resolution SBMS facilitates to increase the resolution of the machine and increases the reproducibility or robustness of the data . May be this is the reason why this machine is widely used. BRP is highly thankful to the University Grants Commission, New Delhi, India for providing Dr. D.S. Kothari Fellowship (No. F. 4-2/2006 (BSR)/13-853/2013 (BSR)). Nascimento-Gavioli MC, et al. Proteome of Plasmoparaviticola-infected Vitisvinifera provides insights into grapevine Rpv1/Rpv3 pyramided resistance to downy mildew. JProteomics. 2016;16:30226-3. De Palma R, et al. Expression of functional tissue factor in activated T-lymphocytes in vitro and in vivo: A possible contribution of immunity to thrombosis?.Int J Cardiol. 2016;218:188-195. Paital B. Mass spectrophotometry: an advanced technique in biomedical sciences. Adv Tech Biol Med. 2016;4:2-8. Li QQ, et al. Multivariate Calibration Combined withMassSpectrometry for Rapid Analysis. GuangPuXue Yu GuangPu Fen Xi. 2016;36:532-6. Vaiano F, et al. LC-MS/MS and GC-MS methods in propofol detection: Evaluation of the two analytical procedures. Forensic Sci Int. 2015;256:1-6. Burgoyne TW and Gary MH. An introduction to ion optics for the mass spectrograph.Mass Spectrometry Reviews. 1996;15:241–259. BanerjeeS and Mazumdar S. Electrospray Ionization Mass Spectrometry: A Technique to Access the Information beyond the Molecular Weight of the Analyte. International Journal of Analytical Chemistry. 2012. Demartini DR. A Short Overview of the Components in Mass Spectrometry Instrumentation for Proteomics Analyses. "Tandem Mass Spectrometry - Molecular Characterization", book edited by Ana Varela Coelho and Catarina de Matos Ferraz Franco. 2013. Bibliographic data: US4553029 (A) ― 1985-11-12. Espacenet.com. 2016. De Laeter J and Kurz MD. Alfred Nier and the sector field mass spectrometer.J Mass Spectrometry. 2006;41:847–854.